Contact us today to schedule a estimate for our experts to prescribe the best insulation for your needs. Blown insulation is a great option when insulating an attic. 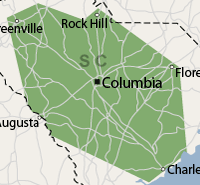 We offer our services in South Carolina throughout Mount Pleasant, Charleston, Simpsonville, Lexington, Columbia, Summerville, Greenville, Spartanburg, Florence, Aiken, North Augusta, Sumter, Greenwood, Chapin, and all surrounding cities and towns. If you have an unfinished attic, you'll be surprised at how affordable it is to seal air leaks between your living space and the attic and upgrade attic insulation by having blown insulation installed. Both energy-saving upgrades can usually be completed in a single day. We want to provide affordable solutions that meet your budget and your needs. Blown insulation is one such solution! Contact us for blown insulation in your attic- and home! We proudly offer a home energy audit to properly evaluate what areas in your home are the source of your comfort or energy problems. Once identified, we will provide the best solutions. Need attic insulation? We offer estimates for attic insulation and the use of blown insulation in Lexington, Columbia, Mount Pleasant, Simpsonville, Summerville, Charleston, Orangeburg, Piedmont, Camden, North Charleston, Hartsville, West Columbia, Goose Creek, Laurens, and all surrounding cities and towns! We are the local certified professionals in your area ready to assist you!